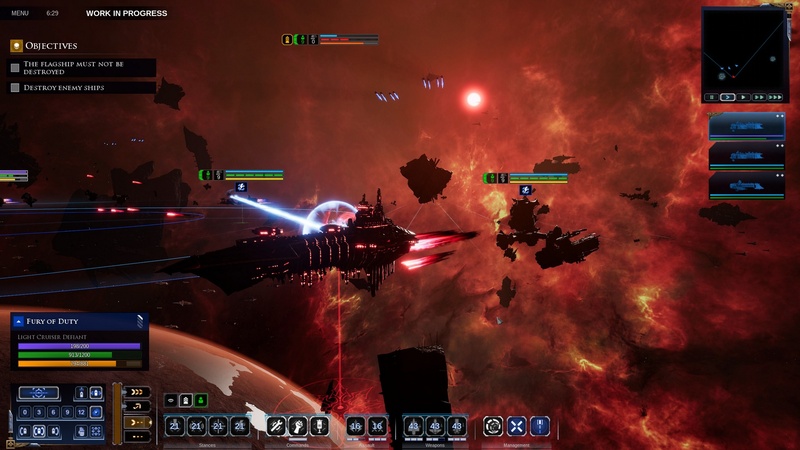 Battlefleet Gothic: Armada 2 is the sequel to the much loved original, continuing the story of Admiral Spire and the various arms of the Imperium Of Man’s space forces versus powerful xenos and the threat of Chaos, corrupted humans hell bent on either killing or corrupting everyone else. 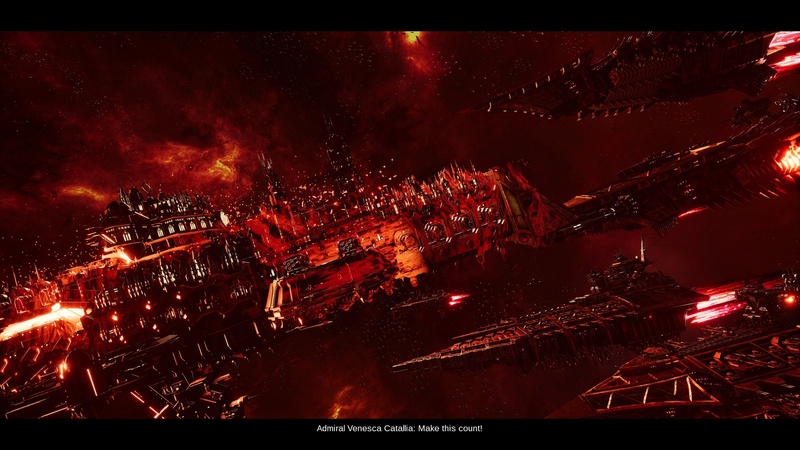 Has Chaos seeped into the Battlefleet Gothic: Armada formula or has it stayed in the Emperor’s light? 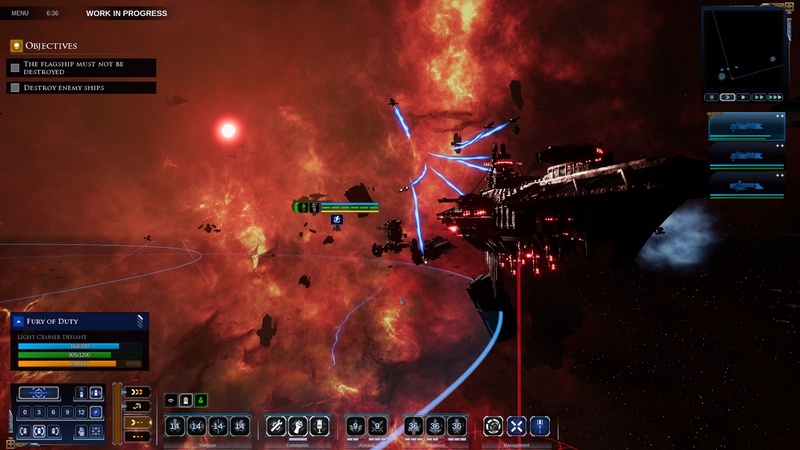 To start with, Armada 2‘s campaign is no longer solely focused on the Imperium Of Man. Both Necrons and Tyranids take a playable role and each have their own campaigns. 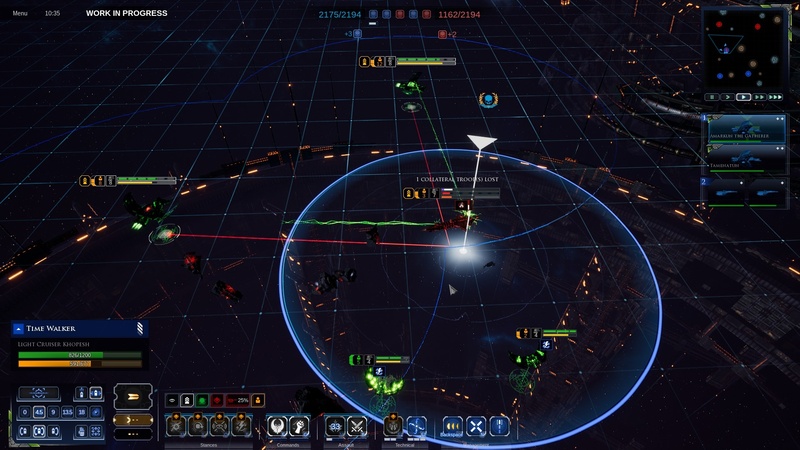 Though some cinematics are shared their gameplay styles are completely unique right from the tactical layer all the way up to the sector-wide strategic layer. The Imperial campaign now features three playable sub-factions; the Imperial Navy makes up the bulk of your forces, supplemented by Space Marine and Adeptus Mechanicus vessels. While the Navy specialises in big guns and slugging it out, the Space Marines are more nimble and specialise in boarding and fighters/bombers, and the Adeptus Mechanicus provide support abilities and some more adaptive tactics. 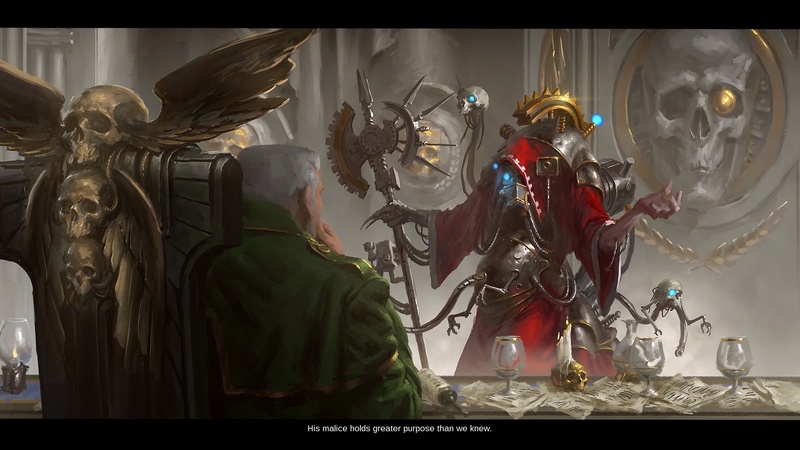 Necrons, immortal constructs of living metal wielding terrible lightning and gauss weaponry have fleets all drawn from the same dynasty but find strength in conformity. They’re not the fastest or the toughest but are neither weakest in any one regard. While a well placed Nova Cannon shot may badly damage or even annihilate a Necron ship from long range, if they get up close the Necrons have a lightning arc stance that can chain damage to multiple enemies for dealing with closely grouped fleets efficiently. Their hulls also regenerate, gaining lost hit points back over time but losing maximum hit points to fuel the ability, making retreat and manoeuvring very important to their survival. Tyranids on the other hand are easy-come, easy-go. Some of their vessels are incredibly powerful while some are incredibly weak and serve only to act as cannon fodder or to ram enemy vessels with powerful front-mounted claws. On the strategic layer, the Tyranids reflect their heritage by consuming worlds, reducing everything they touch to biomass over time and using that to build up their fleets. 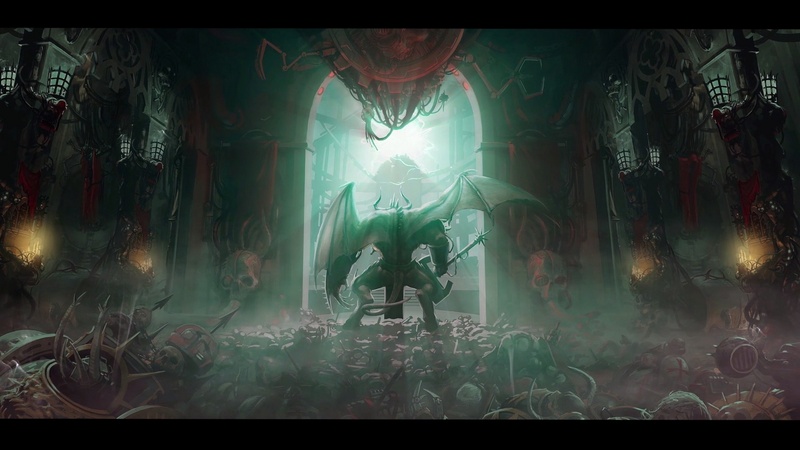 While all three campaigns encourage constant expansion, the Tyranids are unique in that they must keep up their momentum or their power will wane and quickly be eclipsed by their enemies. On the other hand, Tyranids also have no reason to defend their captured worlds, moving like locusts from one system to the next, sweeping aside their occupants and only staying long enough to repair before moving on to the next victim. Combat looks spectacular, and the pace of the game even gives you time to enjoy the view. All three encourage active participation from the player. It’s possible to just set engagement rules (including range, facing, what guns to use, and whether to go after another target once the current order is complete) and let your vessels do their thing but it’s not efficient. Dodging incoming torpedoes or ramming attacks with a well executed manoeuvre feels awesome, even if you have to slow down the gameplay temporarily to have time to input the commands. 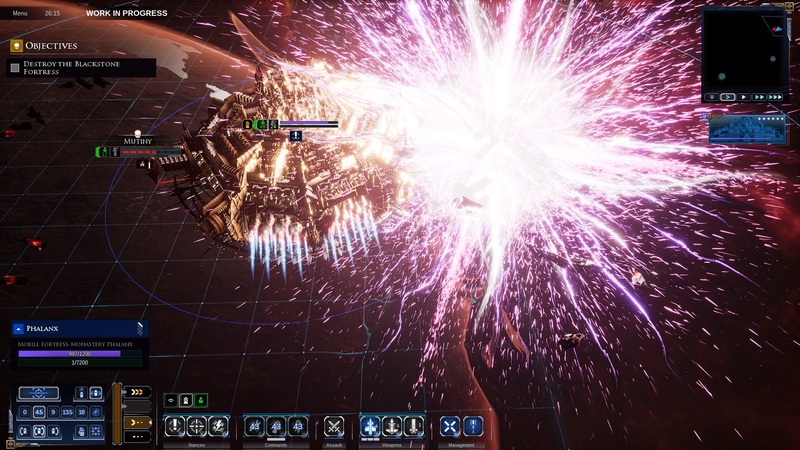 Teleporting a Necron Cairn-class out of a charging Ork ship’s path and devastating its weak rear armour with your powerful particle whips makes you feel like a tactical genius. Even the tutorial manages to be a little more interesting than your typical explanation by virtue of taking part at the fall of Cadia – a piece of Warhammer 40K lore where Chaos forces drop an ancient Blackstone Fortress to the planet’s surface, utterly destroying the valuable world. Going into combat with a lone Space Wolves vessel to hold off the oncoming storm feels great, especially when your ship eventually goes down in a blaze of glory only for overwhelming reinforcements to arrive for you to take control of and avenge your fallen captain. 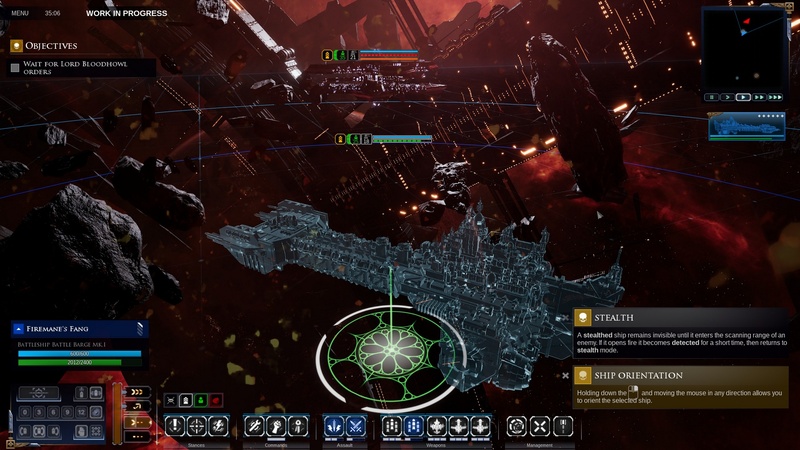 This prologue tutorial ends with a cutscene with free camera control where an Imperial fleet makes a last ditch run on Chaos ships emerging from the Warp only for the Blackstone Fortress to fall on the planet below. Cue the end of the prologue, and Admiral Spire and his vessels emerging from the Warp after being lost for 800 years to a devastated Cadian system. It’s a fantastic set-up to put the fury of the Emperor himself into Warhammer 40K fans. 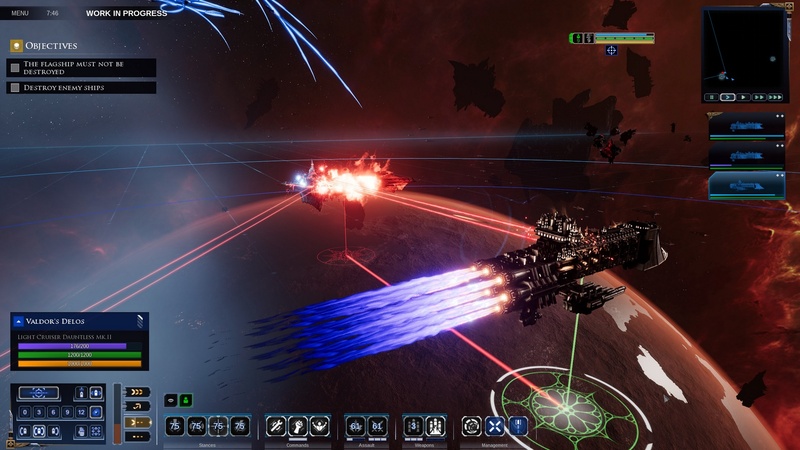 Gameplay on the tactical level remains largely the same as the previous Battlefleet Gothic: Armada but with a more easily readable and less cluttered UI which, coupled with the more comprehensive tutorial, makes for a much easier learning curve and less icon hunting for what you want to accomplish in the heat of the moment. Upgrading fleets and captains has also been streamlined considerably; fleet leaders still level up individually and become more competent but no longer have their own skill point distribution, instead you have a faction wide renown level that grants points to spend in a tech tree providing bonuses to all your forces. This initially seems like a loss of depth, but there’s more than enough to accomplish and upgrade between renown unlocking new ships and agonising over whether you want one upgrade or another on the tech tree. Necron scarab swarms are close-range but heal friendlies and eat the hulls of enemies, making them a devastating weapon against escorts. 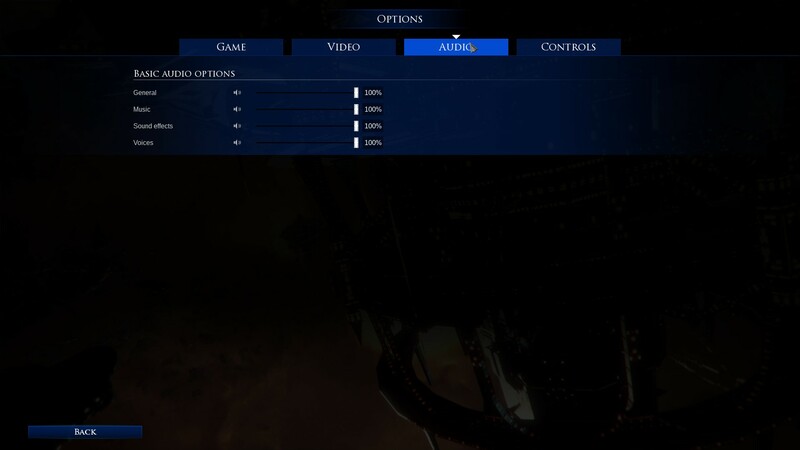 Skirmish and multiplayer modes have even more factions available to them: Imperial Navy, Adeptus Astartes (Space Marines), Adeptus Mechanicus, Chaos, Corsair (Eldar), Asuryani (more Eldar), Drukhari (Dark Eldar), Orks, Necrons, Tyranids, Tau Protectors, and Tau Merchants. Each has multiple sub-factions to choose from for some seriously impressive variety. The only thing missing is an army painter to choose your own colours. 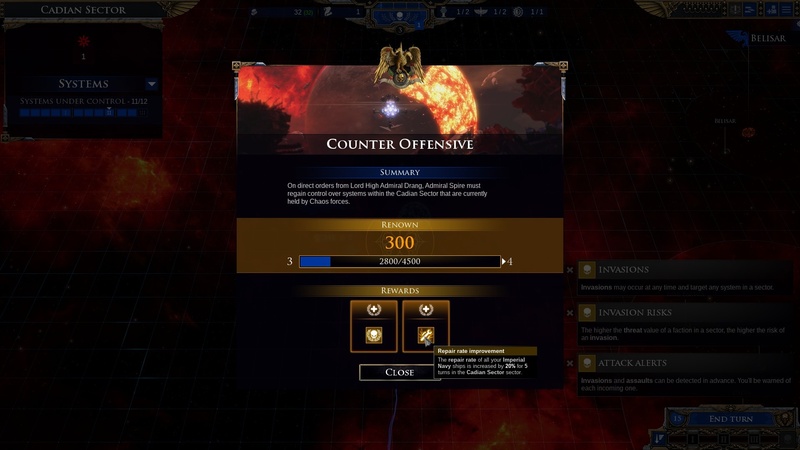 Skirmish includes 1v1 and 2v2 play in both ranked and unranked modes, with unranked also enabling play against the AI. You can use either a custom fleet or one of several pre-built ones. While there’s more faction variety in skirmish there’s far more meat to the game in story mode. 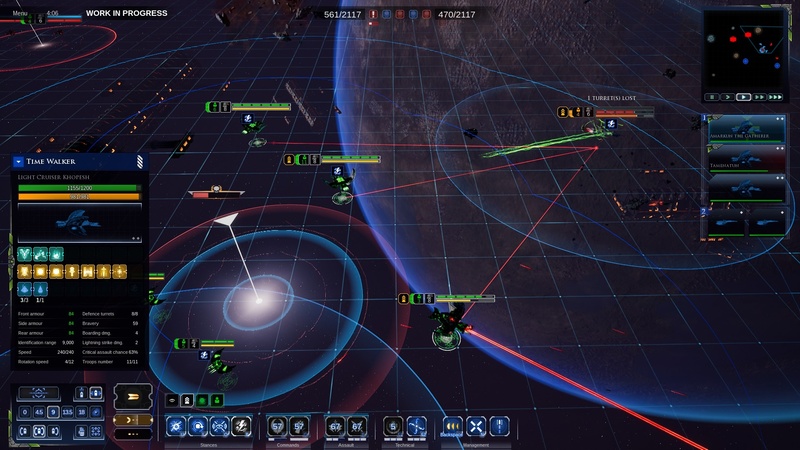 If you’re the kind of player who buys an RTS for the online play, you may come away somewhat disappointed – not because the gameplay’s not good but because it feels a little pointless compared to the focused objective driven campaigns that give your actions context and keep you engaged either with pre-set objectives or personal goals. Regardless of what mode you’re playing it’s going to look and sound great, your giant space churches are rendered in impressive detail and you can zoom in quite close, turning a speck of a ship into a screen filling behemoth where you can really appreciate the scale of these things. Sound is about what you’d expect from a Warhammer game; with thumping macro batteries, crackling electricity from teleporters, and of course the crunchy blasts of heretic vessels collapsing under the barrage of world ending weaponry you’ve unloaded into them. 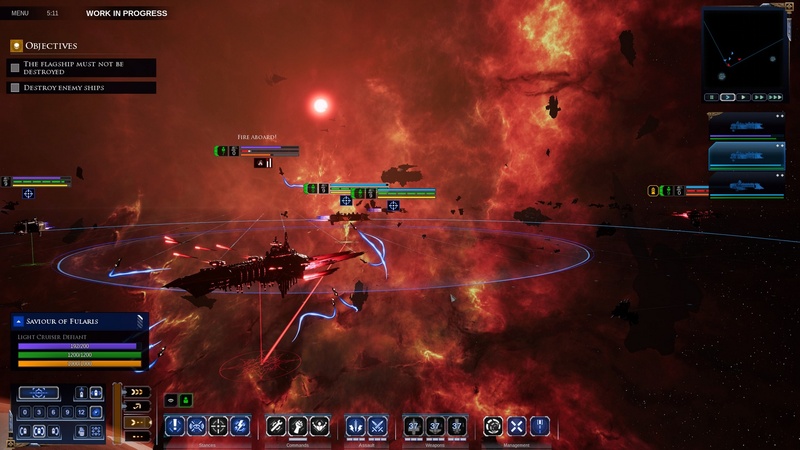 Battlefleet Gothic: Armada 2 is a no-brainer for fans of RTS and especially Warhammer 40K. Though there are some difficulty spikes in the campaign early on no matter what difficulty you’re playing on but they don’t ruin the experience. 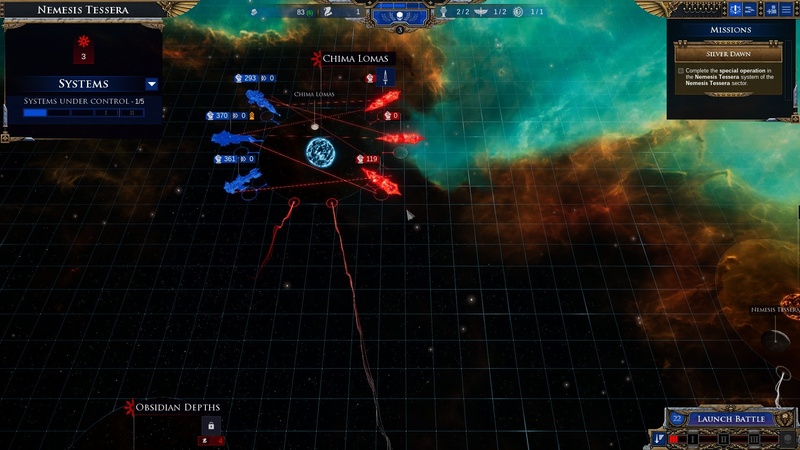 With each faction specialising in their own unique play style there’s something for every style of player and the tactical options are dynamic enough that switching from long-range bombardment to desperate ramming and boarding can take place in seconds. An upcoming cooperative mode, fourth campaign, new ships, and balance updates make it an exciting proposition for the future too. Heresy: There’s so, so much heresy to be punished. Xenos: The huge variety of non-human fleets is impressive and each are unique. 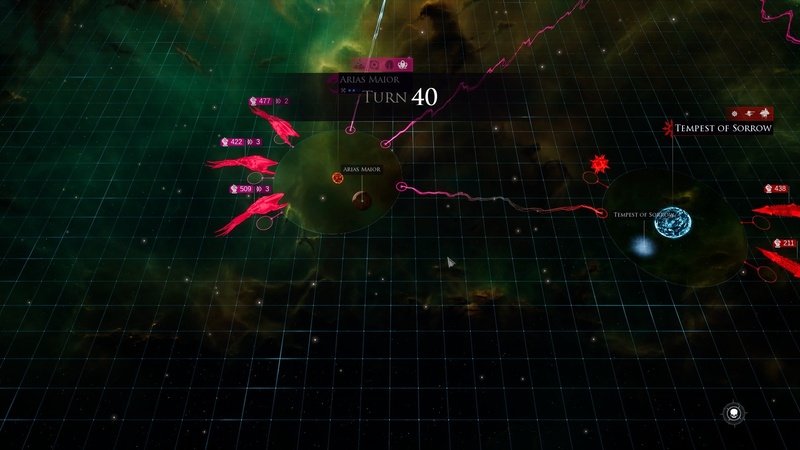 All Ahead Full: Game speed can be changed on the fly, letting you speed through boring bits and slow down or pause to give orders and make decisions. 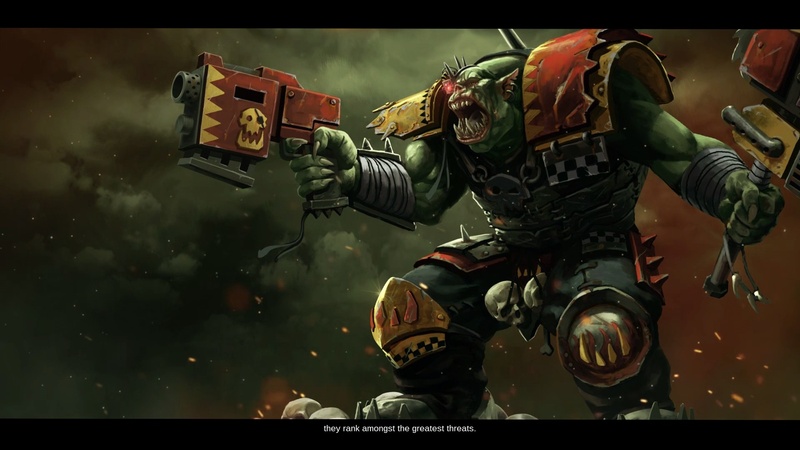 WAAAGH: In M41 there is only war. No diplomacy, no negotiations or treaties, just blowing each other into tiny pieces. Space Weather: Effects like solar storms can strike out of the blue and force a change of pace. Scenery: While there’s not a lot you can do with space, the maps are almost impressively unvaried with floating space junk, asteroid clusters and gas clouds being the only things of interest. 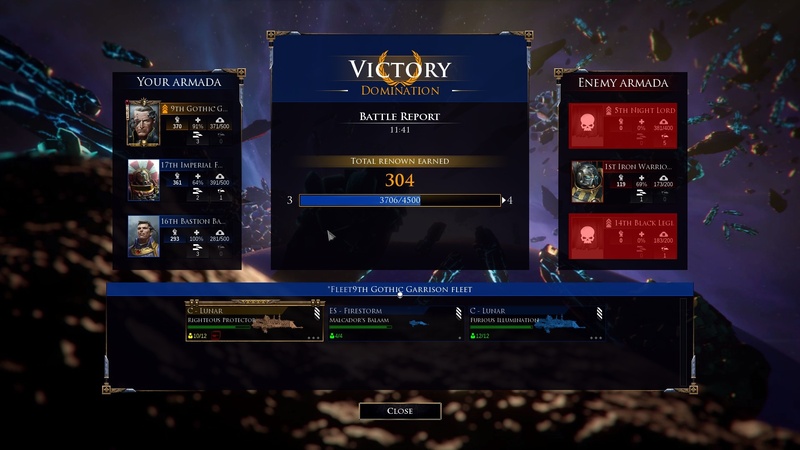 The most sublime Warhammer 40K strategy game on PC. 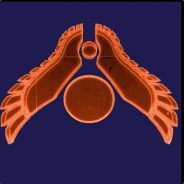 Play it. 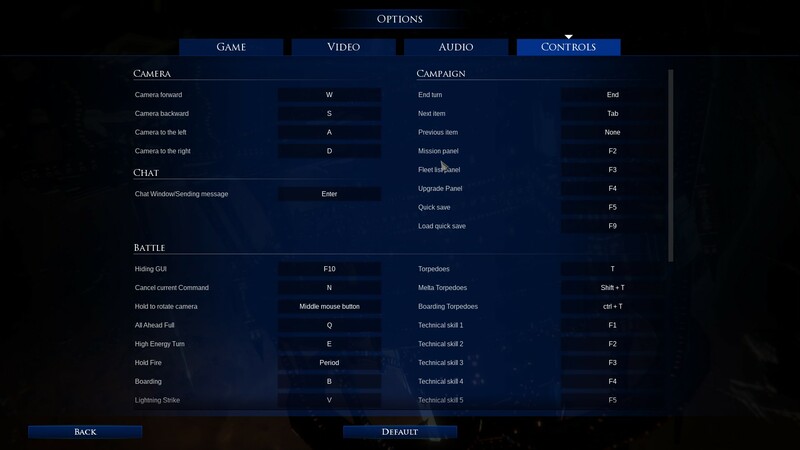 Gameplay: Subtitles, map grid, skip AI's turn, and advanced view toggles. Camera travel speed sliders. Mission type menu. And mouse contain to window and invert Y axis toggles. Graphics: Basic options for resolution, window type, and graphics presets. Advanced options for textures, level of detail, post processing, shadow quality, effects, anti-aliasing, image sharpening, lens flare, resolution scaling, vsync, view distance, and gamma. 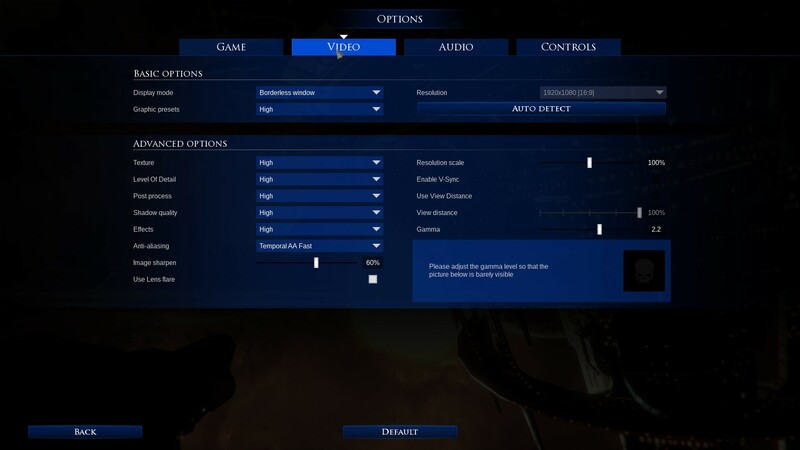 Audio: Sliders for general, music, sound effects, and voices. 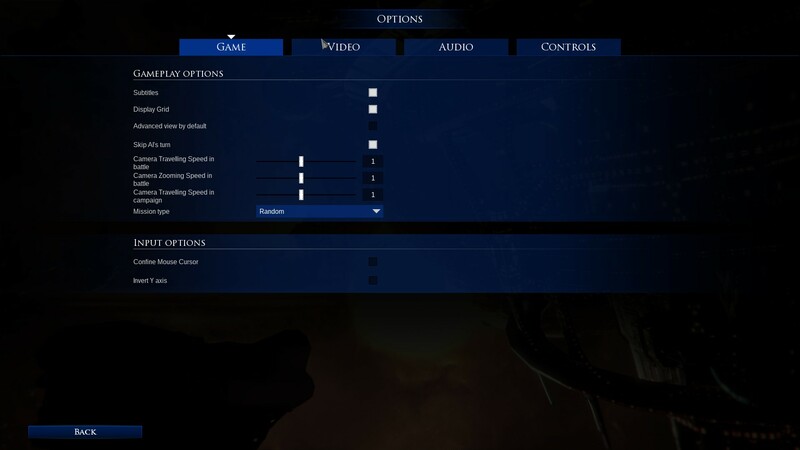 Controls: Fully rebindable keyboard controls, including ability to add shift/alt/ctrl for key combos. Mouse controls can also be rebound. 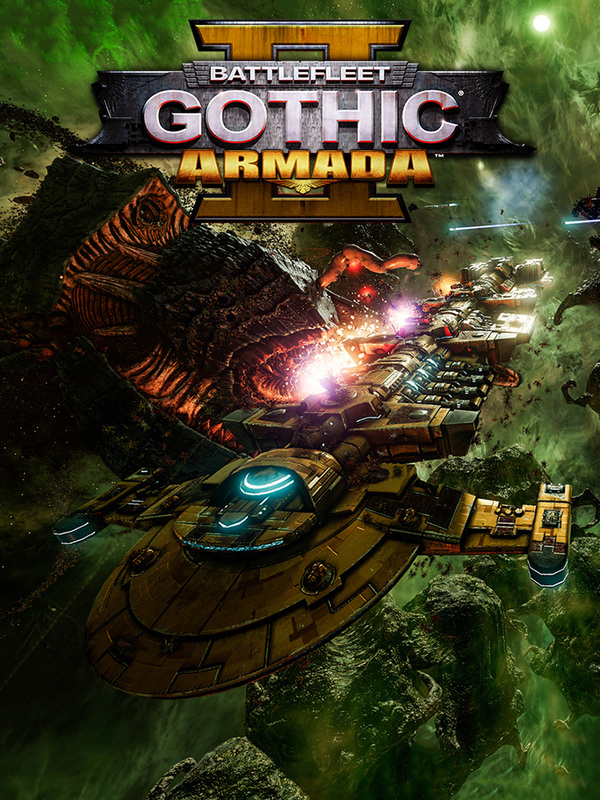 Battlefleet Gothic Armada 2 (BGA2) is very much a sequel to Battlefleet Gothic Armada (BGA1). Not just with the storyline and characters continuing their epic struggle for survival and whatever passes for ambition in the twisted minds of the chaos horde. But, with its very mechanics and presentation too. Everything feels upgraded from BGA1, everything is that much more epic. 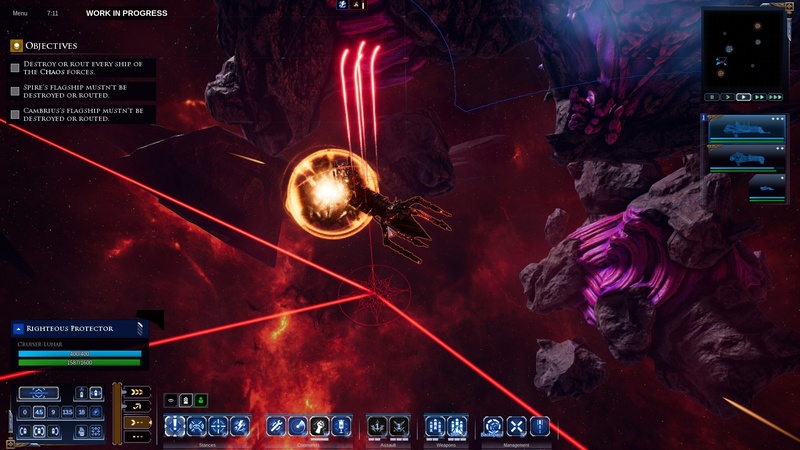 Right from the start, BGA2 bombards you with knock-out visuals. 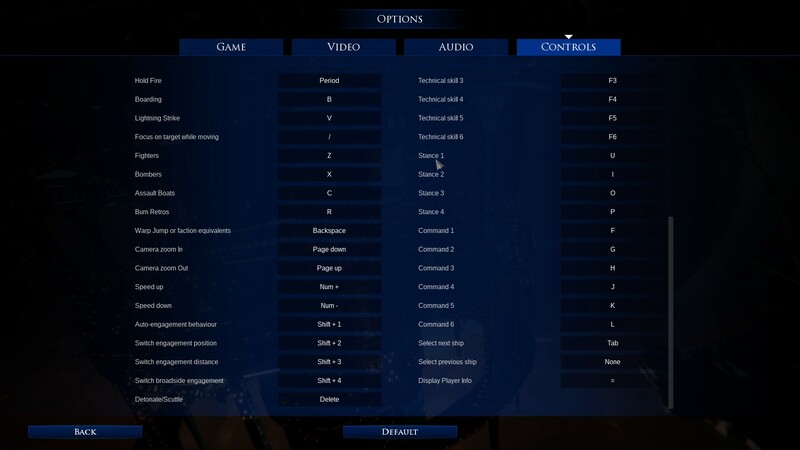 The prologue campaign introduces you to the basic controls. But, it’s not to be missed as the story development has some real mic-drop moments. The Imperial campaign also introduces you to the basics of the strategy map and its faux 4X features. This would be the first place where BGA2 falls down, as it bombards you with multiple info pop-ups cover an array of features. This data blast has to either be absorbed right there or lost forever, as the messages have to be discarded in order to continue with the campaign. A better system would have been to include an in-game encyclopedia, or even just better tooltips (which are currently a bit sparse). 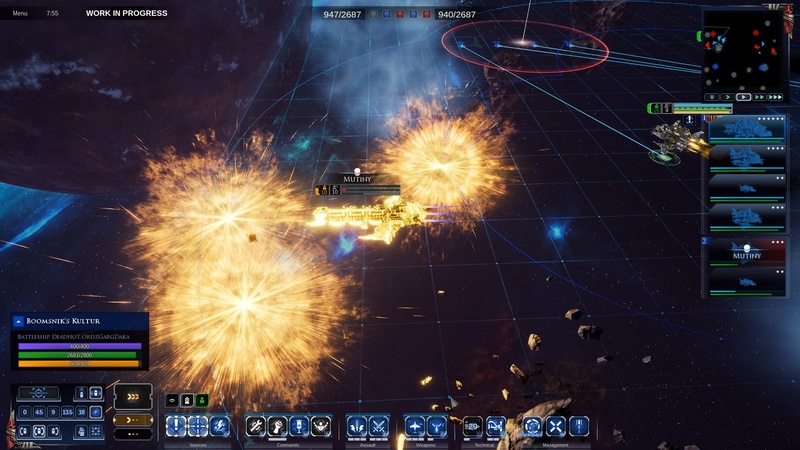 The RTS controls for BGA2 have also been expanded. 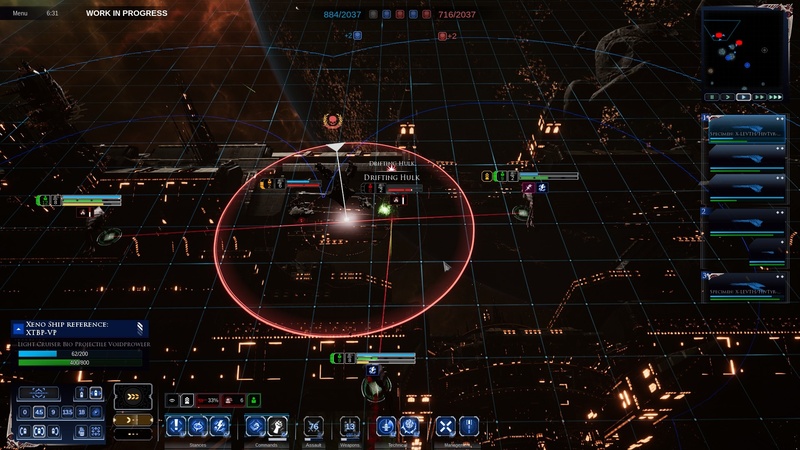 Apart from having a less ornate and intrusive UI than BGA1 (definitely an improvement), the new engagement controls allow you to act like a fleet admiral. At the same time an improved AI for individual ships AI can be toggled to take over the mundane tasks for you. 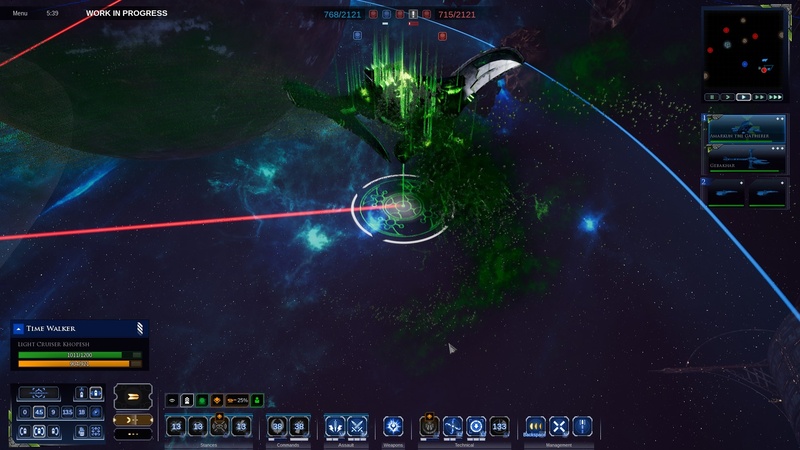 This delegation of tactics to an AI is traditionally a difficult thing to achieve in an RTS, but Tindalous have succeeded. 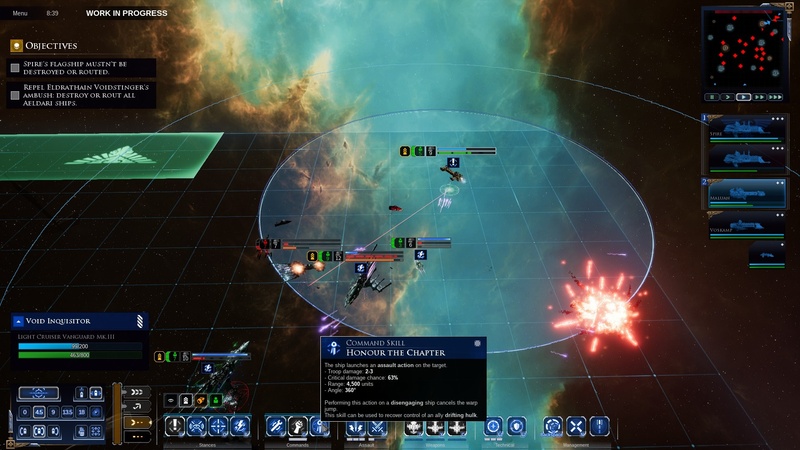 While Tindalous have had to delay a co-operative mode, the multiplayer mode has benefitted from new missions and preset fleets for quick action. 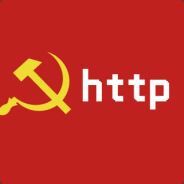 MP mode has also been less plagued with connection issues compared to their last games. However, these modes are still quite sparse, and Tindalous are trying to parse them off as “in beta” despite the game being in full release. Short and sweet, this is more of the same. 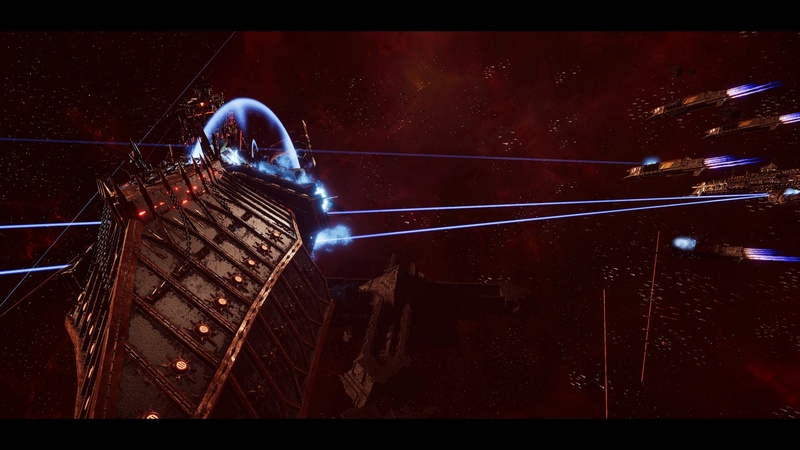 If you liked the first Battlefleet Gothic Armada, you will love this. Not only is it more of the same, it’s more all around. 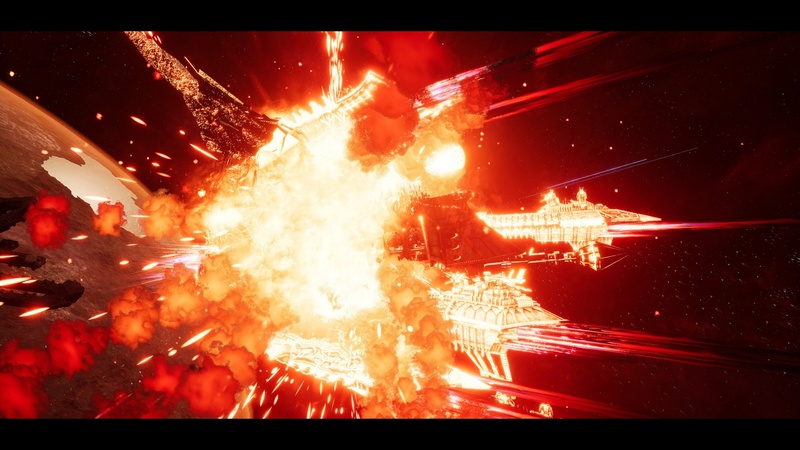 More ships, more skills, more explosions and boy oh boy, but does it look nice. If there was any one complaint, it would be that the camera is far too zoomed in during battles. It does help one feel like they’re right in the thick of everything, but it can make getting a good grip on the space around you an irritation. Okay, no, let’s be honest. The lack of a Chaos campaign is another mark against it. Grumble grumble. 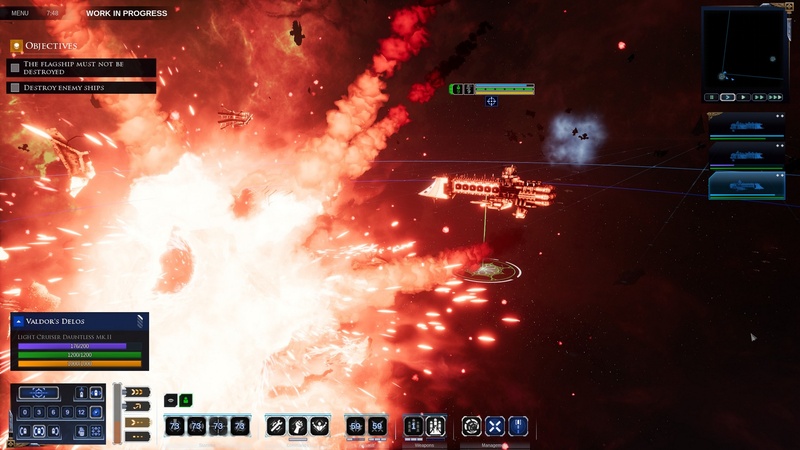 The three campaigns the game does have, however, are extremely bombastic. They really sell the galactic scale of the engagements you will find yourself thrust in to. I mean, dude! An entire planet is effectively reduced to rubble when a Blackstone Fortress (a vessel the size of a not so small city) is slammed down into it. And that’s just the event that sets the scene for things to come. The fall of Cadia is a rather major event in the 40k lore, and seeing it brought to life here does not disappoint. Which is pretty much all that needs be said about the game. 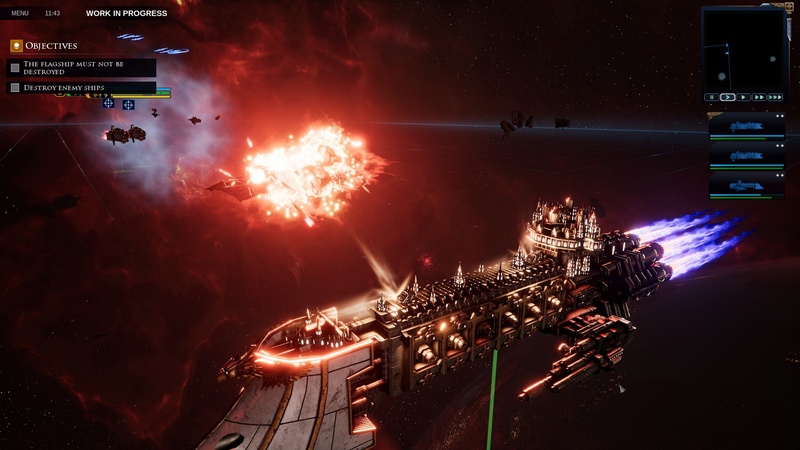 Battlefleet Gothic Armada 2 is well worth your time. Even if, like myself, you are not so good at RTS games, the flow is sedate enough that progress can still be made without having to master all of the game’s mechanics. 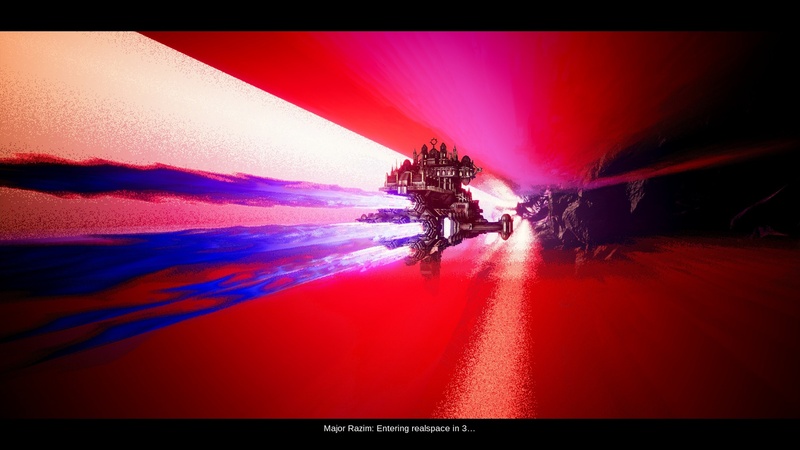 And though there is no pause per se, hitting space engages tactical cogitators, which slow things down even further. Giving players plenty of time to plan out and execute their next move. Is a fun game guys, that’s what we’re trying to say.